Our Cocoa Bar contains the equivalent Resveratrol of 30 Bottles of Red Wine! A great option for today's hectic lifestyles, RegenaLife's Anti-Aging Cocoa Brownie Bars. Our Bar is USDA Organic, Raw, Sprouted Grain, Kosher, Vegetarian and Gluten Free; it contains the powerful ingredient Resveratrol. Resveratrol is the compound found in the skin of red grapes, which is linked to longevity in humans. Recent human clinical studies found that Resveratrol increases the dilation of the brachial artery by a whopping 62%, potentially lowering blood pressure and increasing heart health! A single Bar contains the equivalent Resveratrol of an incredible 30 Bottles of Red Wine! Our Bars are not only incredibly delicious, they are the first functional organic bar on the market designed to improve your quality of life. They are free of processed sugar, corn syrup, salt, hydrogenated oils, genetically modified foods, preservatives and synthetic sweeteners of any variety. Our organic Bars feed your body and cells the proper nutrition needed for sustained energy and healthy aging without chemicals or food additives. Clinical research shows there is a strong connection between inflammation, free radicals and aging. RegenaLife's Anti-Aging Bar contains some of nature's most effective nutrients to combat these, utilizing high levels of key alkalizing nutrients such as Resveratrol, Goji berries, powerful fruit flavonoids and Omega 3,6,9. Regenalife's Whole Food Bar is certified by Brunswick Laboratories for its ORAC antioxidant value. The Anti-Aging Whole Food Bar provides an incredible 7,800 ORAC units per Bar, delivering OVER TWO TIMES the USDA recommended daily intake! This ORAC test is considered the industry standard in determining the antioxidant value of foods. Antioxidants are substances that prevent oxidative damage on a cellular level, a common contributor to disease and premature aging. Our Bar can be used as a meal replacement due to their protein content and low glycemic index, which produce only small fluctuations in blood glucose and insulin levels. This is a key to long-term health, reducing your risk of heart disease and diabetes while offering a key to sustainable weight loss. 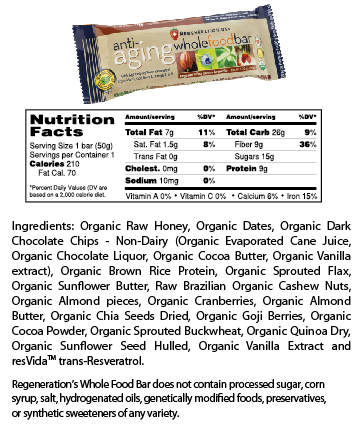 RegenaLife's Anti-Aging Whole Food Bar is a delicious organic option for people on the go – promoting sustained energy, a balanced pH, healthy blood sugar levels, cardiovascular health, and healthy weight along with a healthy body and mind!